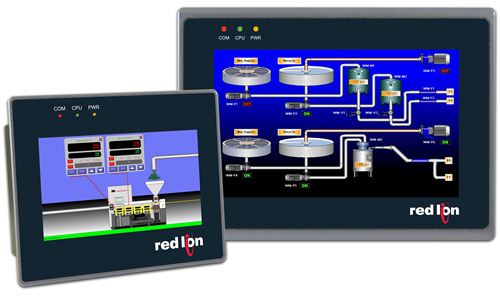 Red Lion’s Graphite® operator panels are the industry’s first rugged HMI touchscreens to combine I/O modules with protocol conversion, data logging, web-based monitoring and IEC 61131 control capabilities. Optional expansion racks extend capabilities to enable organizations to connect, monitor and control more industrial processes. Red Lion’s G3 HMI operator panels offer expanded connectivity with built-in Ethernet and a CompactFlash card socket standard, and up to 5 high-speed serial ports. G3 HMIs also include protocol conversion, data logging and web serving, making access to data quick and easy. Red Lion’s G3 Kadet HMI operator panels are available with 4.3″ or 7″ color touchscreen displays offering Ethernet and high-speed serial ports for connectivity. In addition, Kadet HMIs feature easy configuration using Crimson® software.